With the Seamaster 2018 ITTF World Tour Platinum Kaisa China Open on the near horizon, we take a look at the line-up for the second day of qualification action in Shenzhen as players look to secure their places in the main draw, which is set to get underway on Thursday 31st May. The final two rounds of Men’s Singles qualifying matches will be played out on day two of the qualification tournament with the action commencing at 10.00am (local time). One of the fixtures to look forward to is an all-Danish battle as Jonathan Groth prepares to take on fellow compatriot Zhai Yujia at the summit of the draw: intriguingly this marks the first time that the two have met at an international ranking event with the victor of the tie going on to face one of Vladimir Samsonov or Bojan Tokic later in the day. Losing out to Mattias Karlsson by the narrowest of margins at the Liebherr 2018 World Team Championships, England’s Liam Pitchford will have an opportunity to avenge that defeat when he opposes the Swedish player on the final day of qualifying in Shenzhen while Yan An’s duel with Ho Kwan Kit has all the makings of a spectacle. Just the one round of the Women’s Singles qualification event remains with 32 players set to battle it out from 1.20pm for the last available main draw places. Both heading into the day off the back of five game victories in the previous round, Germany’s Han Ying and Singapore’s Yu Mengyu will now meet face-to-face in a high stakes encounter. One of these stars will miss out on qualification – but which one will it be? 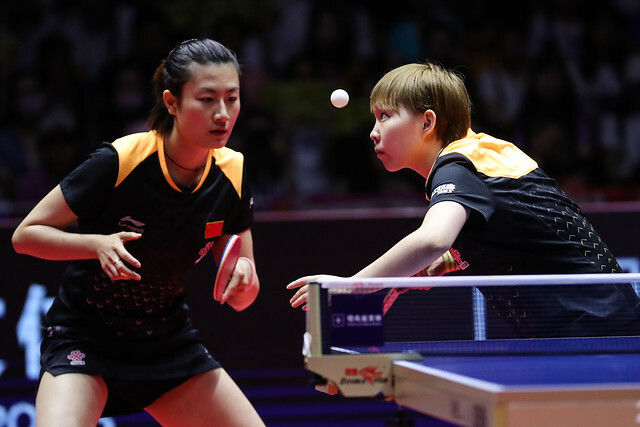 Exquisite in her opening qualification fixture, but China’s Wu Yang could face a sterner test when she takes to the table against the ever-improving Romanian star Bernadette Szocs in their first head-to-head match at an international ranking event. Responsible for Japan’s Kasumi Ishikawa’s main draw exit at the recent Seamaster 2018 Hang Seng Hong Kong Open, Korea Republic’s Lee Eunhye will be hoping for a similar outcome in her final qualifying encounter as she takes on another Japanese opponent in Honoka Hashimoto. We also have two Mixed Doubles contests scheduled for Wednesday’s action, both of which feature partnerships representing Indonesia. Getting underway at 6.50pm, the pairing of Donny Aji and Lilis Indriani will attempt to upset the Spanish duo of Alvaro Robles and Galia Dvorak while the other Indonesian team of Ficky Santoso and Gustin Dwijayanti takes on Austria’s Stefan Fegerl and Sofia Polcanova. Watch the action unfold live from Shenzhen with itTV.